My mom wants me to add videos more often so she can see Cade. Here was a video I made today of Cade smiling. He was in a wonderful mood today, I'm sorry he wasn't "talking" more though. Enjoy. 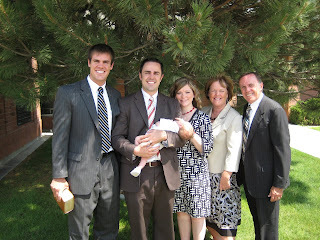 We finally were able to have Cade's blessing Sunday, July 20. I wanted to do it on this day so that I could at least have two of my family members attend. 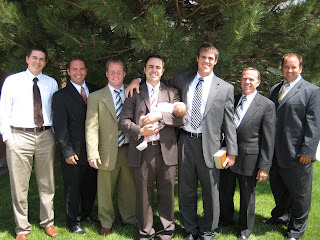 Cade was lucky enough to have his daddy bless him at church with our friends and family. 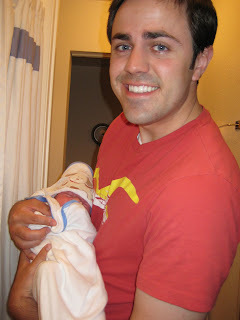 Here is Cameron with our first born son after Cade's blessing. They are so cute! 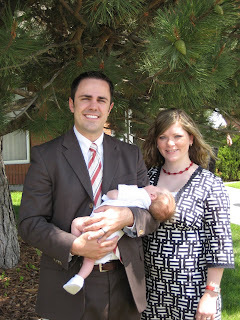 Our little family after his blessing. Cameron's brother Dave, Lisa, Mason, and Ellie had to leave before we took the group pictures so Cameron took one of just them. All the friends and family who were able to come. 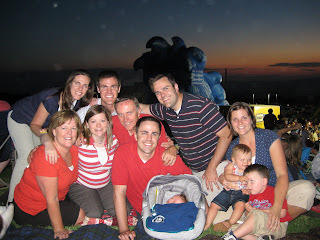 Left to Right: Joe Dean, Lindsey Dean, Merideth Sullivan (holding son Owen), Landon Sullivan, Cameron and Cade, Bonny Day, Brittany, Dallas Sommers, Nancy Long, Geoff Long, Steve Long, Paul Dean. Thank you to all those who were able to attend, we really appreciate it! 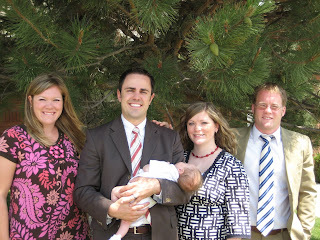 Cameron's family members who were able to attend. Brother Geoff, and his parents Nancy and Steve. Brittany's family members who were actually able to come. Sister Bonny and brother Dallas. After the blessing we went to Cameron's parents house who had a wonderful dinner and get together for us. 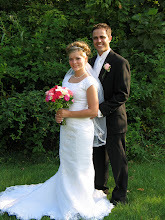 It was a wonderful day and we appreciate all that everyone did to help make this day special for our family. 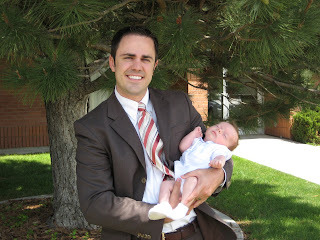 This is a picture of Cade in his after blessing outfit at the Long's home! I thought it was so cute, he looked like a little golfer. 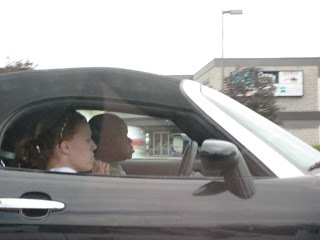 So, Bonny and I were driving around in Provo, UT and I look over and guess who was sitting in the car next to me!!! (I thought it was a little kid at 1st) Gary Coleman from Diff'rent Strokes. We couldn't believe it. So, Bonny took a picture as proof...so here it is! Bonny came to visit for the first time after me having the baby. 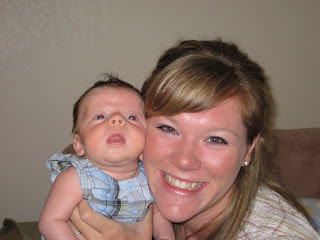 She was especially excited b/c she is now a first time aunt! Cade and Bonny loved eachother, she was so good w/ him. It was so nice having her around. We went out to eat, shopping, visited w/ eachother, etc. She cooked, cleaned and also woke up w/ Cade in the middle of the night and brought him to me, it was so nice! It was wonderful having her around. 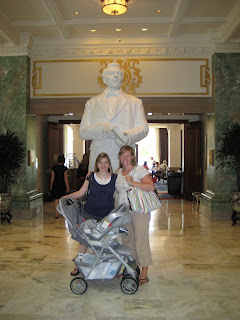 Here's us after a trip to the Distribution Center in the Joseph Smith Memorial building. Bonny dressed Cade up each day in the cutest outfits. She gave me a lot of Owen's outfits. 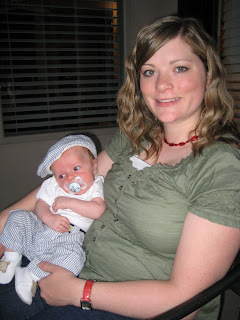 This is one of my favorites b/c he looks like a little man. Look at that huge smile! 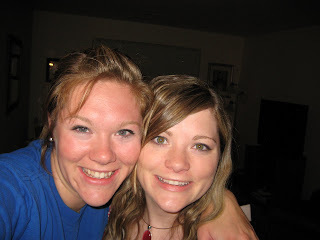 This was the last night we had together before she left. Cameron was nice enough to let her sleep w/ me in our bed (don't worry, he slept in the living room) and we had a wonderful time watching the "Office" and talking. I was so sad to see her go, it was so much fun having her around. I can't wait to see her again. 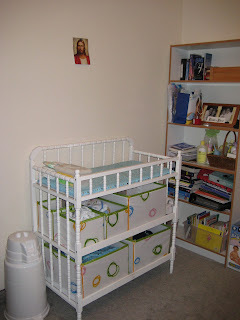 Cade's room is my favorite room in the house. I love sitting in there or just passing by and glancing in. It's so peaceful, clean and cute! My in-laws actually gave me most of the furniture in the room. 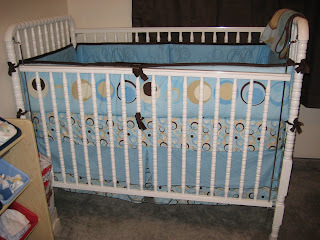 They gave me their old crib, changing table, book shelf and bought me the glider rocker for my birthday! My 2nd grade team and the Kindergarten team gave the storage shelf. 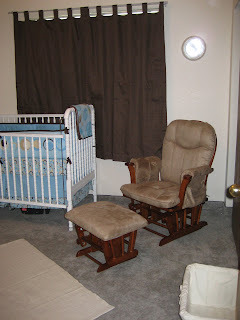 Here's a picture of the glider rocker, which was the last thing I needed to complete his nursery. I put up the curtains because I wanted to block out the light, thinking it would help Cade sleep in a little longer, it hasn't helped too much. I didn't have a dresser for Cade, so when my in-laws gave us this changing table I decided just to buy these cute boxes from Ikea and use them as his dresser. 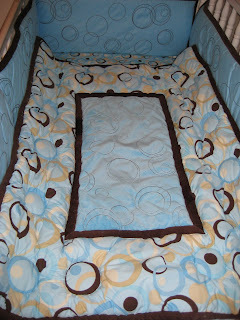 I love the bedding, the colors are so cute. 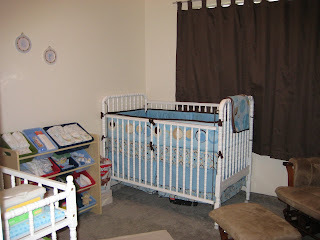 This is a picture of the inside of his crib. Last week Cade really started trying to smile and react to us playing with him. 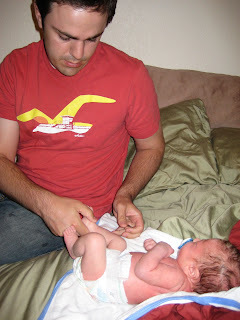 Last night after his bath we had him on our bed and Cameron started playing around with him. 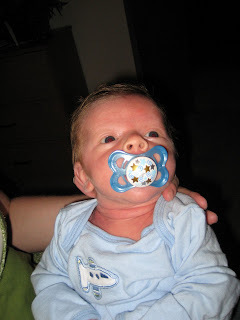 We think Cade was trying to laugh and smile at us (I think it was a mix of that and him being really hungry). He's such a grunter! 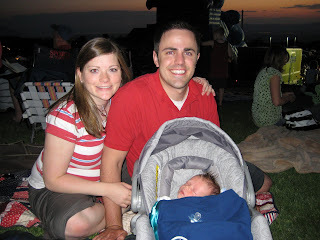 On the 3rd of July Cameron's family threw a huge party to celebrate the 4th. There were over 50 people at the Long's home. They had hamburgers, hot dogs and lots of salads and desserts. 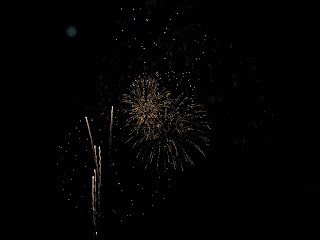 After the party everyone met at the golf course up the street from their home for a firework show put on by the city. It was a lot of fun. 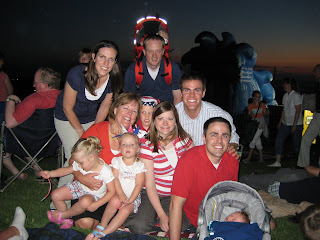 This is a picture of our little family waiting for the firework show to begin. 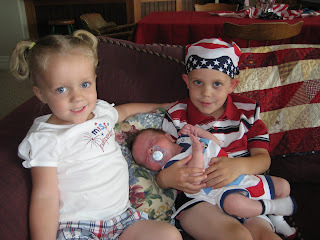 Cade with two of his cousins, Chloe and Jackson, at the party. 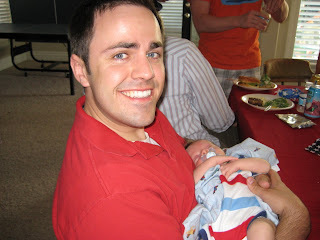 Daddy holding Cade after eating the yummy food from the party. 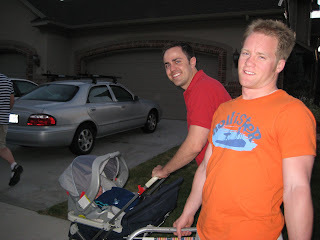 Uncle Dallas and Daddy pushing Cade to the golf course for the fireworks. The Long family members. Cameron's parents and his sister Stacie, brothers Geoff and David. 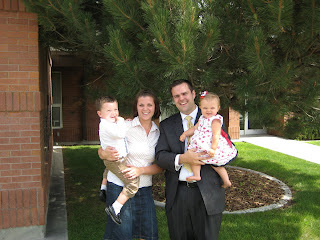 David's wife, Lisa and children. Stacie's family came to visit the Longs for a week. 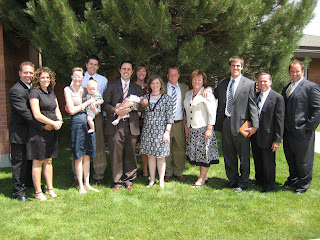 Here we are with Stacie, Brandon, their children, Grandma Nancy, and Uncle Geoff. 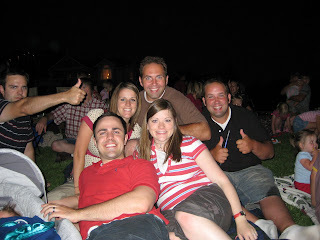 Our friends Lindsey, Joe and Paul Dean hanging out before the show. 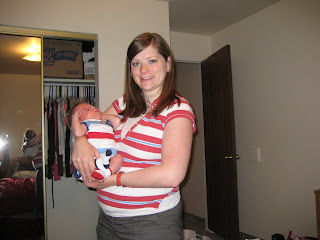 Mommy and Caden all dressed in their red, white and blue. We had just gotten back home from the Long's. 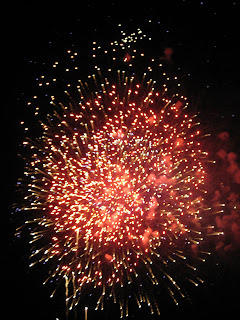 This is the actual Fourth of July day, mine and Dallas's birthday!!! We are now 24. Dallas came and spent the whole weekend with us to celebrate our birthday. 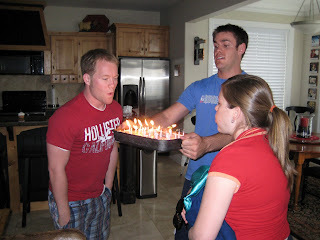 This is a picture of us blowing our our candles on the yummy mint chocolate chip ice cream cake that Cameron and his mom, Nancy, made for us. We had a wonderful birthday. Cameron gave me a really cute video camera and the Longs gave me a glider rocking chair to put in Caden's nursery, which is finally complete. 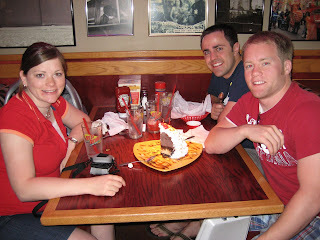 Cameron treated us to Red Robin for our birthday. They gave us this huge yummy slice of ice cream cake for free. 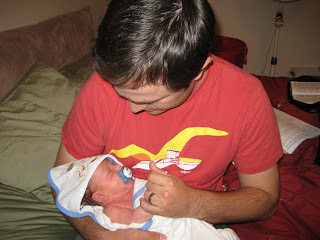 This past Saturday, June 28th, we were finally able to give Cade his first real bath! 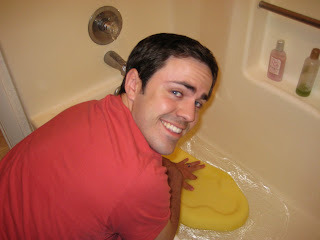 Cameron prepared the bath to just the right temperature. 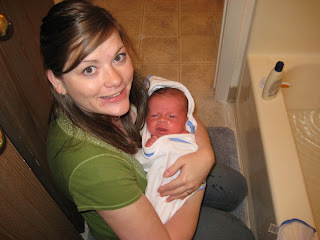 Brittany attempting to bathe Cade and persuade him that he is ok. We thought he would love his bath because he likes sponge baths so much, but we were wrong. Still attempting to calm him down and finish his bath. 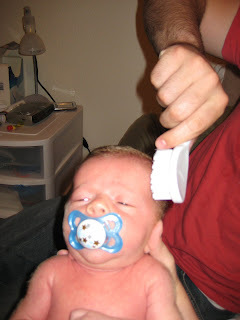 Finally done with Cade's bath. 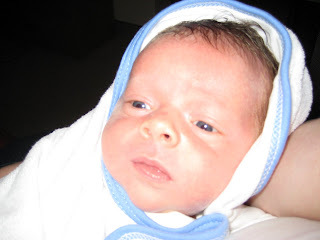 Brittany cuddled him in his new towel. 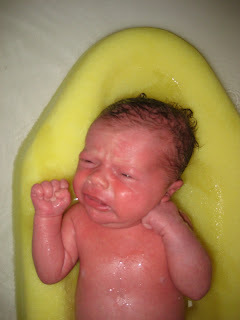 Cade was much happier being out of the bath. Cameron trying to help warm and comfort Cade. Cameron continuing to comfort Cade. 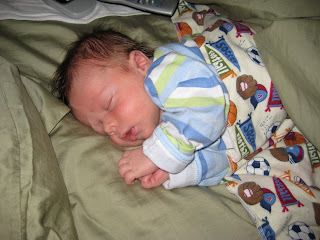 Cade's favorite part was his his lotion massage, he was so relaxed and ready for bed. 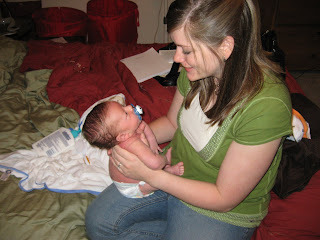 Cade looking at his mommy, he is so much more relaxed. 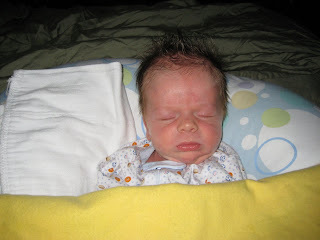 Cade all ready for bed. 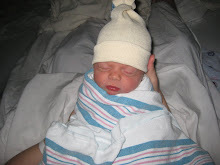 This is a picture of Cade from the next night, we gave him a sponge bath instead. He loved it! Cade and I love to cuddle together in the mornings. One morning I laid him next to me and all of a sudden he rolled over right next to me and put his hands together, I just had to take a picture. 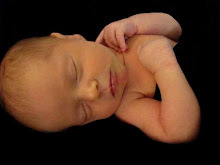 He is soo cute! 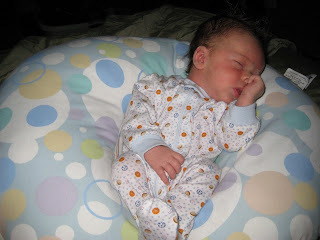 Cade loves to sit in his boppy, he falls asleep in it all the time. 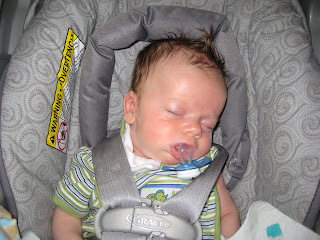 Another picture of Cade falling asleep in his boppy. 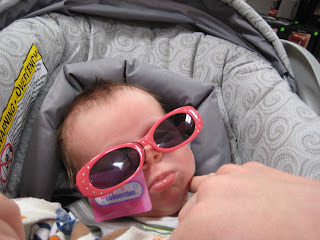 I also took this picture because he looks so funny in these p.j. 's because he's so skinny.